Apply powder like a pro. 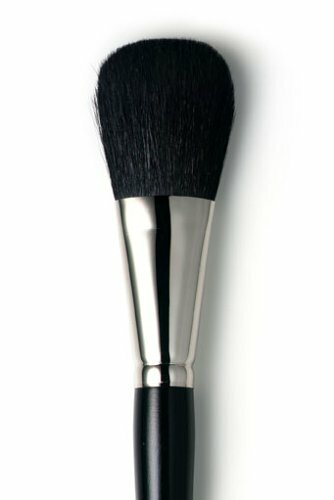 Fluffy, full-sized brush smoothes powder on evenly for a perfect finish. Eliza's exclusive eyeglasses are just what you need to perfectly apply make up or groom brows!Her glasses have easy flip lenses with magnification for one eye while applying makeup to the other.Thanks to Eliza, professional eyebrow shaping has become a "must" for women who want to dramatically enhance their own unique beauty...Eliza, Waxing Director/Eyebrow Designer at Avon Salon & Spa located at Trump Tower in N.Y.C., pioneered an industry by creating the first-ever boutique devoted to brow shaping.Eliza has been called a guru, a magician, and according to Allure Magazine, "[Eliza] remains an arch above the rest. "With her unsurpassed expertise, she has perfected the brows of celebrities, fashionistas and media notables. Elizaâs signature product line is a favorite among beauty editors, appearing regularly in magazines such as Allure, Cosmopolitan, In Style, Lucky , Self, Seventeen and many more... Each product is specifically engineered to meet Elizaâs exacting standards, so now you can achieve the most beautiful brows at home or on the go. Our 3-in-1 pencil sharpener fits all pencil sizes. Two different sized openings accommodate various pencils to keep them ready for action! The perfect tool for trimming excess hair. Curved for extra safety and more precise cutting. Stainless steel.Thanks to Eliza, professional eyebrow shaping has become a "must" for women who want to dramatically enhance their own unique beauty...Eliza, Waxing Director/Eyebrow Designer at Avon Salon & Spa located at Trump Tower in N.Y.C., pioneered an industry by creating the first-ever boutique devoted to brow shaping.Eliza has been called a guru, a magician, and according to Allure Magazine, "[Eliza] remains an arch above the rest. "With her unsurpassed expertise, she has perfected the brows of celebrities, fashionistas and media notables. Elizaâs signature product line is a favorite among beauty editors, appearing regularly in magazines such as Allure, Cosmopolitan, In Style, Lucky , Self, Seventeen and many more... Each product is specifically engineered to meet Elizaâs exacting standards, so now you can achieve the most beautiful brows at home or on the go.